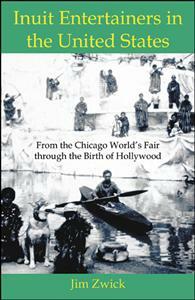 Illustrated history of Inuit involvement in American entertainment from the country’s first world’s fair through the creation of the modern amusement park to the first Hollywood films with Inuit stars. Inuit Entertainers is a profusely illustrated history of Inuit involvement in American mass entertainment from 1892 to 1922. It documents performances at eleven world’s fairs and expositions, at dime museums, with Barnum & Bailey’s Circus, at Coney Island, and in the film industry throughout the first decade of the Hollywood studios. At the center of the story are two extraordinary women. Esther Eneutseak led a group of Labrador Inuit from the Paris World’s Fair to Hollywood. Her daughter Columbia, a World’s Fair baby born at Chicago in 1893, wrote and starred in the first Hollywood film with a credited Inuit cast.